The familiar notion that expeditions ought to test the limits of human strength, skill and endurance dominated preparations for my eight-week, 1,000-kilometre canoe journey in northern Quebec. In retracing a traditional all-seasons route into Nunavik (formerly known as Ungava)’s rockbound interior with my wife Kim, I nervously anticipated long travelling days on icy tidewater of Hudson Bay, sprawling inland lakes and powerful rapids; the backbreaking task of lugging a summer’s worth of food and gear on countless untracked portages; and the energy-sapping toil of moving steadily day in, day out, regardless of mercurial weather and certain onslaughts of insect pests. In late June we drove to La Grande, Que., near the terminus of the James Bay Highway, and loaded our 250 kilograms of food and gear onto an Air Inuit cargo plane. We then hopped a commercial flight to Kuujjuarapik, our starting point at the mouth of the Great Whale River, and waited for our outfit to arrive. On June 30, we loaded our 17-foot Headwaters Prospector canoe to capacity and began the paddle on tidal waters. Over the next 10 days we waited out strong winds, dodged icebergs and navigated the infamous Gullet — a narrow, five-kilometre corridor of whirlpools and eddies that connects Hudson Bay’s open coast to expansive Richmond Gulf. It was a relief when we finally proceeded inland. We were tracing the 1938 route of J. Kenneth Doutt and Arthur Twomey, biologists from Pittsburgh’s Carnegie Museum who made a winter journey into the subarctic hinterland in search of freshwater seals, rumoured to live in sprawling inland lakes far removed from Hudson Bay. Twomey’s colourful recollections, recorded in Needle to the North, his 1942 travelogue, describe a frozen land of many hardships, but provide few specific geographical references to the region. However, we discovered a trove of captivating information in A.P. Low’s 1896 report for the Geological Survey of Canada, which reflected our 32-portage upstream paddle to Lacs des Loups Marins in painstaking detail. It turns out the region’s sinuous eskers and dramatic rock plateaus haven’t changed much in 122 years. 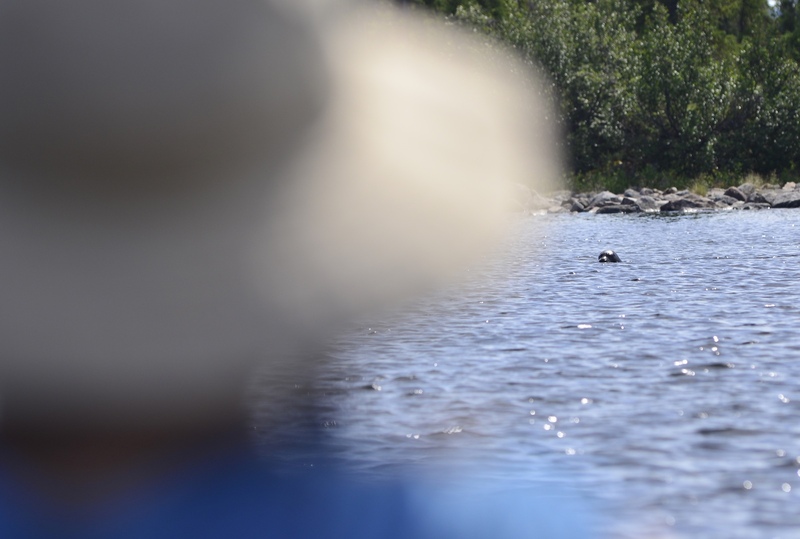 Our first freshwater seal sighting came so soon as to be almost anticlimactic. Unlike Doutt and Twomey, who rationed food while waiting weeks for a seal encounter in 1938, a curious pair of Phoca vitulina mellonae greeted us as we took our first strokes on Lacs des Loups Marins in mid-July. Regular sightings of this endangered species continued as we transited the lake, culminating when we were followed at close range for nearly an hour by a ponderous, scar-faced seal on Lac Bourdel. And so, the first five weeks of the expedition were as expected. We were sore and exhausted, but pulled along by a wonderful rhythm of travel, moving steadily for 28 consecutive days. We exited freshwater seal waters and crossed the treeline and Lac Minto, aiming for the headwaters of the Rivière Innuksuac, which we planned to descend 400 kilometres back to Hudson Bay. Sure enough, relentless winds arrived on August 1. We would wake up at 4 a.m., hoping to make the most of any moment of relative calm, going full tilt for as long as we could make progress before making camp in the scant shelter of waist-high willows and glacier deposited boulders. We were wind-bound six out of the last 12 days. We hunkered long hours in the tent, shivering in all of our layers, senses bombarded by wind-whipped nylon and minds racing, wondering if the gales would ever let up. Once-voracious appetites waned and sore muscles healed. Suddenly, the physical demands of paddling and portaging paled in comparison to the psychological stress of the harshest weather we had ever experienced. We reminded ourselves to be patient, that the struggle would be worth it, and we nibbled away the distance in small, high-intensity chunks. Finally, we paddled into the Inuit town of Inukjuak. As we have so many times before, Kim and I quietly celebrated the awareness that we’d made the journey together; our 53-day adventure revealed much about ourselves, each other and the wild landscape we traversed.